Vdara recently added a Club Lounge option for guests staying at the hotel. If this sounds familiar, it’s because last year their neighbor, Aria, added two club lounges. The concept of hotel guests having access to a semi-private lounge isn’t new. A number of national hotel chains have offered a similar add-on for their hotel rooms for years. Las Vegas casinos have typically offered their biggest spenders complimentary access to a lounge. The Caesars Entertainment Diamond Lounges are a nice amenity for Diamond and Seven Star level Caesars Rewards members. Complimentary drinks and snacks in a quiet environment can be a godsend in Las Vegas. The Vdara Club Lounge is closer to a traditional hotel club lounge than a casino players club lounge. The new lounge is now open and available to guests that would like access to this amenity. Like most hotel club lounges, this is a secluded space from the rest of the hotel. 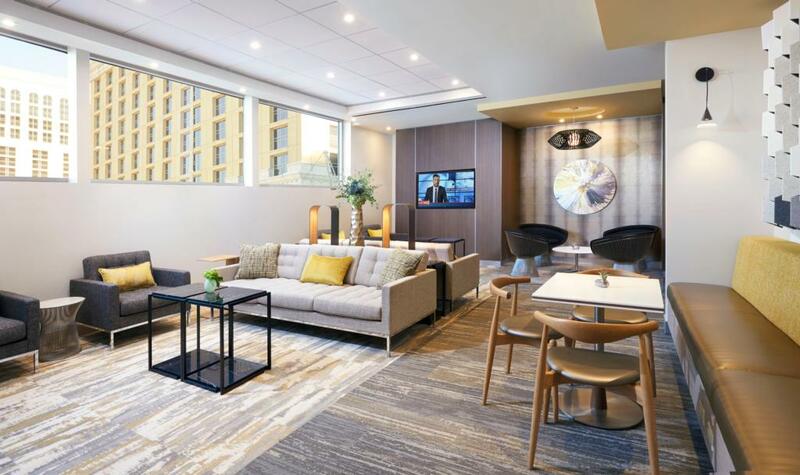 The Vdara Club Lounge is a deluxe facility for guests staying in the hotel’s Luxury Suites, City Corner Club Lounge Suites and Studio Fountain View Club Lounge Suites. Guests who choose any other room categories may access to the Vdara Club Lounge for a nightly fee ($75 Sunday – Thursday; $100 Friday – Saturday). The Vdara Club Lounge provides guests with gourmet meals, a dedicated concierge service and a nightly social hour complete with drinks. Pre-Arrival Concierge: This perk is to ensure that each Vdara Club Lounge guest has a custom and stress-free stay. Vdara’s concierge will contact guests prior to arrival to assist with booking restaurant reservations, show tickets, and any other needs. The concierge will still be available in Las Vegas at the Vdara Club Lounge to assist guests in-person throughout the duration of their stay. Dining: Similar to Aria, the Vdara Club Lounge will feature a rotating selection of fresh gourmet cuisine. Vdara’s culinary team creates dining options daily. Breakfast is served from 7 a.m. – 11 a.m.; light snacks are available from 11 a.m. – 6 p.m.; and desserts are offered from 6 p.m. – 8 p.m. The lounge also offers quick bites for guests on-the-run. Vdara’s Club Lounge also features a selection of grab-and-go items throughout the day. Social Hour: Every afternoon from 2 p.m. – 4 p.m. guests can enjoy the Vdara Club Lounge’s Social Hour. Hors d’oeuvres along with select beer and wine will be available. Guests can purchase an adult beverage at the lounge during other hours if one is needed. Frankly, cocktails and other drinks should be an all-day amenity for guests paying for access. Collaborative Work Spaces: Vdara Club Lounge provides a naturally lit, comfortable and quiet place for guests to work. This is probably the most useful service to business travelers in Las Vegas for work and conventions. The lounge has access to business services that will make productivity easy for guests away from the office. Some of my favorite vacations outside of Las Vegas have included access to a hotel lounge. It’s nice to be able to grab a drink or snack before heading out to enjoy the city. That said, this access isn’t always a “good value” as much as it’s a nice perk if it’s in the budget. Access to the Vdara Club Lounge could become a sweet upgrade if you’re staying at the hotel. Using the $20 trick to gain access to a club with a retail value of $75 – $100 isn’t too bad if you can’t get bumped to a bigger and better room. The upgrade game changes as often as Las Vegas changes. This is just another possibility if you’d like lounge access but not enough to pay for it.